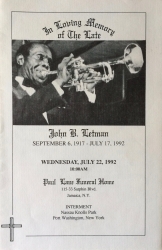 Johnny Letman was a great Jazzman of the midwest who played in some of the most popular big bands of the Swing Era including those of Lucky Millinder, Cab Calloway and Count Basie! Letman's career in music never faltered, and he was busy in the mainstream Jazz scene of the '50s and '60s and toured Europe with a band of his own in the 1980s. Letman was present during many periods in Jazz. This funeral program from July 22, 1992 commemorates his long career.